Second Advent or what is expected in Turkmenistan under Ruhnama? The second advent of Ruhnama in the socio-cultural area of Turkmenistan makes us think not only about circling politicians, but also what is expected in the country in the future and how the neighbors view such development. New Turkmen national culture policy is the Niyazov-initiated surgery of lively and diverse Turkmen culture of various groups of Turkmen and other ethnicities to some varnished imitation, substituting genuine culture. Those, who are not aware of Turkmen realities, need to understand the following: titular ethnic group consists of complex tribal structure. The scientist still cannot explain the emergence of many groups. Each group – clan or tribe – has many unique independent features. 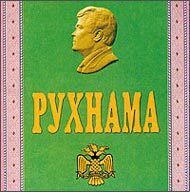 Ruhnama (The book of the soul [Turkmen]) is the book, officially written by the first Turkmen President Saparmurat Niyazov (Turkmenbashi). The goal of the book is to create positive image of Turkmen people, heroic interpretation of its history, the review of Turkmen customs and definition of moral, family, social and religious norms for modern Turkmens. It was mandatory to read Ruhnama in schools, universities and governmental organizations. New governmental employees were tested on Ruhnama at the job interview and even at driver’s test. After the death of Niyazov the book lost its popularity while in the spring of 2009 Turkmen authorities tried to eliminate the books. However, in the summer of 2009 the university applicants had to take Sacred Ruhnama as mandatory admissions exam. In the mid-December Gurbanguly Berdymukhammedov one more time strongly recommended the government to use Ruhnama as an instrument of «youth education». Today, the state policy is oriented at ignorance of this unique feature. One of the proclaimed goals is so-called «the union of nation», assuming weak influence (political) of certain clans. One of the later innovations, reasoned by the swine flu is the list of «domestic hajj», equal to making hajj in Mecca. Big hajj is de facto substituted by surrogate. Moreover, the government assigns new «sacred places», eradicating sacred places of local clans. Regulation and officialism, in this case, lead to the neutralization of locally unique culture. The official hajj list is the attempt to force religion to serve national state-promoted idea. Such rude intrusion of the government in the religion may face the opposition from Muslims and build ground for radical attitudes. It has to be mentioned here that Turkmen version of Islam is quite soft with the number of local peculiarities. These variety and tolerance support stability in the region. Inside the communities there are local mechanisms, supporting social structure and stability. This is the reason why local communities are independent from the state and, of course, the government is concerned about it. The state forced the leveling of cultural and religious life of the society, limiting access to education and total downgrade of the quality of education, creating obstacles for the visit abroad. The judicial system reminds the gollywog: in the last 15 years it produced no single verdict of not guilty. Now let us see what is happening in Turkmen society. Under growing state pressure the society is looking to avoid this pressure and forms its own response. The reliable and working mechanism is represented by the clan structure, where everybody is linked to each other by mutual liabilities. In order to avoid repressive judicial system people try to set the conflicts inside the community on the basis of traditional law that leads the community to mediaeval condition. The leveling of cultural peculiarities and their ignorance leads to cultural vacuum, the emergence of offended cultural groups on the one hand and religious radicalization on the other hand. No doubt, the radicalization is fueled by direct interference from abroad. The sources in various regions of Turkmenistan report the emergence of so-called «Wahhabi», the radical Islamists, forming own communities. Such communities offer financial aid and education to their members with the opportunity «to continue education» abroad. On the background of poverty and lawlessness, the Wahhabi community is the only solution. Therefore, instead of cohesion into single ethnic group, Turkmenistan is under risk to produce even more conservative clan structure, cultural groups, less tolerant to each other, as well as the group of radical Islamists, ready to commit jihad against Disbelievers. This analysis must warn the current partners of Turkmenistan – the consumers of natural resources of the republic. Needless to say, the totalitarian rule is convenient for neo-colonialists: it is easier to bargain with one person instead of democratic system. If the negotiations fail, it is also easier to replace the single leader. The example is Chile with the rule of Pinochet. In the pursuit of natural resources one should bear in mind that powerless, financially and spiritually poor society acquires radical features. The main terrorist threat comes from such communities. Exchanging human rights to natural gas, so-called developed countries contribute to the death of the nation with unique and rich culture and the emergence of another «flash point».